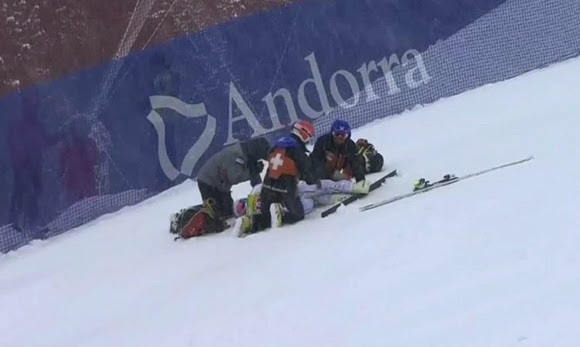 Soldeu, Andorra – On a day full of delays, crashes and tough conditions, Laurenne Ross, of Bend, Ore., powered through fresh snow to take second in the Soldeu Audi FIS Ski World Cup — her first podium spot since Garmisch in 2013 — behind Saturday’s super G winner, Federica Brignone of Italy. Tamara Tippler of Austria was third. Battling wind and snow that caused the race start to be lowered and the start time pushed back by three hours, many skiers struggled down the gnarly course, including Colorado’s Lindsey Vonn, who was a pre-race favorite. Vonn slid out of the course, crashing near the bottom, and was taken off the hill on a sled by ski patrol. She was later determined to have sustained a hairline fracture in her patella, or kneecap. Ross – who has been on a roll this season with five straight top-10 finishes – took full advantage of the good course conditions during her run to put down a blazing time before the snow really started falling. Stacey Cook (Mammoth Mountain, Calif.) was the next American, finishing in 24th, with Mikaela Shiffrin (Eagle-Vail, Colo.) also cracking the points in 29th. It was Shiffrin’s first speed event back after her injury and only her second super G World Cup start ever. Anna Marno (Steamboat Springs, Colo.) was 33rd, Jackie Wiles (Aurora, Ore.) 43rd and Abby Ghent (Edwards, Colo.) 52nd. Alice McKennis (New Castle, Colo.) DNFed. Despite her crash, Vonn maintained her overall World Cup lead over Switzerland’s Lara Gut by eight points, after Gut finished Saturday’s race in 16th. Vonn leads the super G standings over Gut by 64 points.